Milledgeville, GA–The inaugural HoopNation Girl’s Preseason Showcase was a stage for approximately 40 high school level players from varying parts of Georgia to compete against their peers in an evaluation setting. The idea of the camp was to create an extra exposure avenue to help with recruitment prior to the school ball season. Central Georgia Technical College, Georgia College & State University, and Valdosta State University were among the schools in attendance to evaluate the field. We’ve gathered our notes and today we look at the top performers from the event. Reeves showed off her ball skills in the paint and on the perimeter. The 6-foot-3 post impressed with her ability to shoot over both shoulders in the low post, as well as facing up knocking down jumpers from the mid post area. However, her vision and passing ability from the block are what popped off the screen. Everything considered, Reeves looks to be a low to mid-major caliber prospect. Her recruitment has slowly started to pick up as of late. She has an official visit to West Florida later this month and has received interest from several division-II programs since the showcase. Carroll showed off an array of back to the basket moves on both blocks during scrimmages. The 5-foot-11 senior also demonstrated play making ability pushing the ball up the floor off the rebound. Most important, her positive attitude and high energy were contagious all day. After closely evaluating her through drills and scrimmages, she grades out to be low-major talent for the collegiate level. Carroll will definitely be an asset for LM programs looking for a skilled combo-forward. From the outset, Smith was in attack mode offensively. She has a natural knack for scoring the ball. The 5-foot-7 lead guard got into the lane at will and hit jumpshots from all over the court. On the flip side, she needs to focus more on getting teammates involved moving forward. 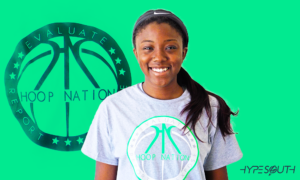 Nevertheless, Smith impressed and is definitely one to check in on for colleges in need of a scoring guard. Let me preface Bowen’s eval by saying, she was one of the more vocal young ladies on hand, communicating with and encouraging teammates during drill stations. However, her soft spoken demeanor quickly turned into fierce competitiveness when it was time to compete during scrimmages. The 5-foot-11 junior didn’t mind mixing it up down low and her capacity in the mid-range area was noteworthy. 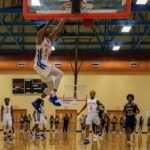 All in all, Bowen has a really nice understanding of the game and looks to be in line for a breakout 2017-18 season. Right off the bat, Cushenberry’s high basketball-IQ jumped out at me. She made sure teammates were in the right spots defensively, called out screens etc. Offensively, the 5-foot-11 small forward is very unselfish and does a little bit of everything well. The more I watched her, the more impressed I became with her as a basketball player. In spite of not grading out as a HM caliber player, Cushenberry is going to make one heck of a player at the LM level. 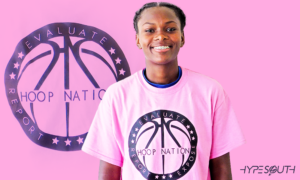 Right now, she holds offers from division-II programs Barton College (NC) and Montreat College (NC). Low-majors looking for a good athlete and an even better student, I highly recommend Taylor Ann. Cooper is a good point guard with superb ball handling skills. Defenders caught a hard time all day trying to stay in front of her. She effortlessly penetrated and kicked it to open shooters or dropped it off to post players for easy layups. 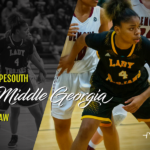 Moving forward, she will have to work on not over dribbling the ball; however, her court awareness and creativity will make her valuable at the next level. 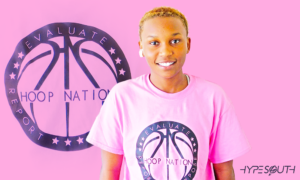 I’m hearing she will have to take the JUCO route, so junior colleges in need of a floor general, I would recommend inquiring about Angel Cooper. Jackson aggressively attacked the paint and showed superior speed out in space. The 5-foot-6 senior also rebounded well from the guard position during scrimmage play, but most impressive was her high motor, which caught the attention of several college coaches in attendance. Jackson’s commitment to doing the little things may end up earning her an offer by season’s end. Geveke was the only middle schooler in attendance. The young combo guard was not intimidated and really impressed with her shooting from beyond the arc. She was seemingly automatic when teammates kicked it out to her. Further, she displayed developing ball handling skills and proved to be a solid defender. 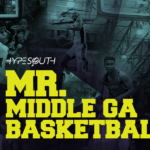 The future is very bright for the three-point specialist from Mount Paran Christian. Williams demonstrated that she could effect the game both scoring and passing the ball. The 5-foot-7 point guard impressed onlookers with her ability to finish in transition with both hands. Further, her pullup jumpshot in the mid-range area is a real weapon. 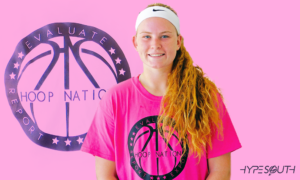 At the time being, she is garnering interest from a couple of low-major schools, but look for her recruitment to take off moving forward. Reid competed at a high level on both ends. She really frustrated opponents with her ability to defend. Offensively, the 5-foot-5 speedster effectively penetrated the lane and scored easy baskets in the open court. However, she must polish her jumper in order to take her game to the next level. Overall, I was more than impressed with her competitive spirit.